In January 2013, Island Health confirmed its commitment to replace Cowichan District Hospital (CDH) and in summer 2018, the concept plan to replace CDH was approved by provincial government. With the concept plan approved, the next step in the planning process is to prepare a detailed business plan in collaboration with community members, patient partners, clinical and non-clinical staff, physicians, local First Nations and numerous community partners and organizations. Planning and construction for a new facility is a five-phase process that will take place over several years and there are a number of steps that must be taken before a new hospital can be built. The business plan will establish the service model solution and cost for the proposed hospital, and is the second step in the process. 3. Procurement: Who will build it and how? We have put together some responses to some frequently asked questions that we have heard so far during our engagement and planning process. Check back regularly as we will update this document throughout the course of the project. Projects of this size and scope require thousands of individual decisions need to be made. Strong guiding principles will ensure that these decisions are made towards common objectives which reflect the needs of the people we serve. The above principles describe how we want the broader health system in the Cowichan region to look in the future and will guide our decision-making within the Cowichan District Hospital (CDH) Replacement Project. 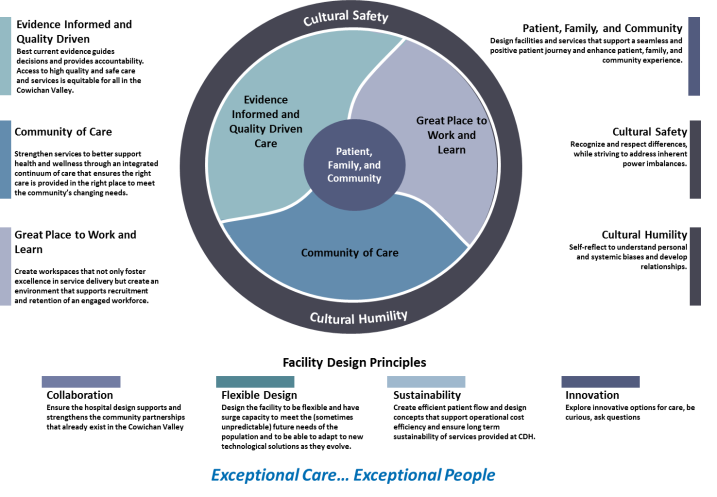 Along the bottom of the diagram are our four Facility Design Principles, which describe the elements that are key to the success of the new CDH facility. Please review these principles and let us know your thoughts. We are interested in learning what is most important to you for the future of health services in the Cowichan Region and for the new CDH. The hospital is a critical component of health and care services within a community – but it is only one part. There is a wide range of primary care, community care, health promotion and long-term care services available to support your health and wellness. As we plan for a replacement hospital in the Cowichan Valley, we are looking at the overall system of health and care, both now, and into the future. We know there is more that can be done to help keep people healthly in their homes and with family. Island Health is committed to strengthening our community-based health supports so you and your loved ones can avoid a hospital stay whenever possible. Take this online survey to help us learn more about how we can work together to build a service model and business plan to replace Cowichan District Hospital. We have a unique opportunity to look at how our hospital fits within a vast network of community-based health care, where 80% of services and supports are delivered. Technology is also changing the landscape of health care and enabling more services to be safely delivered in locations beyond the hospital campus and even in your home. Those options for patients and families will continue to evolve and expand well into the future. We want to ensure the design of the new CDH takes this into consideration, and supports the entire system of health and care, in whatever form that takes.